When the night time cold comes, a lot of people have to move inside to a more cramped indoor space. 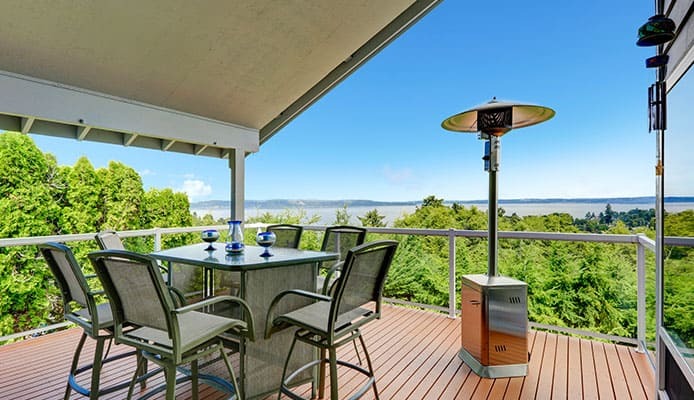 The perfect way that is to get around that issue is by getting the best patio heater to ensure that you keep enjoying the relaxed outside atmosphere. In order to get the best outdoor heater, there are a few different aspects that you need to take into account. The area that you need to heat and the size of the heater itself is going to be vital, as is the heat output and the range of the heater. In our buying guide, we will go through all these key features to give you all the information you need, and have completed patio heater reviews to show you the best products on the market. After you’ve finished reading, you’ll be able to choose the best patio heater for you. 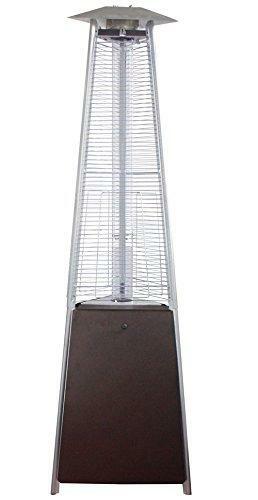 This is a top rated patio heater that will be able to give you a huge amount of warmth when you are outside. This will allow you to sit in comfort with your friends and family to enjoy the evening without worrying about being too cold. One of the best features of this product is that it has an advanced pilotless burner system, which means that it has no standing flame. The heater also has an easy start electronic ignition system that will let you quickly get it burning with minimal fuss. It is able to give you 46,000 of BTU which can give you a great level of heat. There are many different styles available which all have a reservoir at the bottom that can hold 25 pounds of sand. There are also wheels attached to make it highly portable. AmazonBasics have been able to produce this great patio heater that comes in a range of different styles, which means that you will be able to find the perfect heater that is going to match the outdoor area that you have. It is able to give you up to 40,000 BTU’s of heat output which should be good enough for most uses. The stainless steel burners and heating grid are going to be able to give the heater a large level of durability. This is another product that has wheels for great mobility. The heater has an electronic ignition system to allow you to immediately start it and it also has an automatic shut-off tilt valve to give you the highest level of safety if an accident happens and the patio heater is knocked over. In terms of stand up propane heaters, this is another quality product from AmazonBasics but one that comes in the classical patio heater shape instead of the pyramid style. There are different style options available, allowing you to find one that suits you. The finish it has is powder-coated to give it a very high level of durability. The heat output 0f 46,000 BTU is up there with the most powerful products on the market. The piezo ignition will be able to give you an immediate start with minimal effort. This product also has an auto shut—off valve and wheels to ensure that it will be easily transported from one place to another. This product is very easy to operate and will give you a great amount of comfort when you are sat outside. It’s important for patio heaters to be able to offer you enough heat to keep warm and anything at 40,000 BTU’s or above is going to be able to give you that level of heat. It has a stylish bronze finish that will look great wherever you go. In order to be able to move the heater around to where it is needed, wheels are essential as they can be quite heavy, especially at the bottom if it’s weighted. This heater is going to be able to use a standard 20-pound propane tank. In order to start the patio heater, it has a reliable electronic igniter to get you started straight away. It is also another product that has an auto shut-off valve for added safety. Overall, this is a very impressive heater. 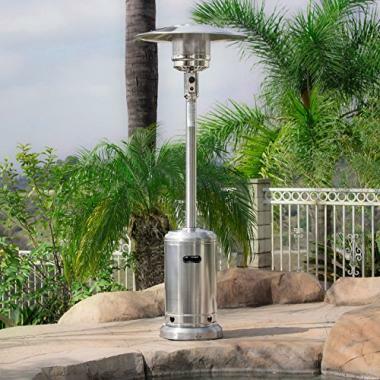 This is a propane patio heater that is one of the most stylish products on the market, its stainless steel design will look great wherever you are while also being highly durable and resistant to rust, ensuring it will last for many years. One of the best features of this heater is the fact that it can be lit with just one push of a button with its piezo ignition system, making it as easy to use as possible. The heat control nob is going to allow you to get the perfect heat setting. At its most powerful, the heater will be able to fire out 48,000 BTU’s that is going to be able to you an intense amount of heat in even the coldest of situations. This is a safe heater that is going to be able to cover a very wide area. This is one of the best outdoor patio heaters on the market and another that has a great level of design. It is 87 inches tall and has a hammered silver powder coated finish that not only gives it a good look, but also a high level of durability. There are wheels attached to the base of the heater which is going to make it very easy to transport to wherever you need it. This product has one of the highest heat outputs on the market as it is able to give you 48,000 BTU’s. It can work off either propane or butane and the heater comes with a one year warranty to give you peace of mind should anything go wrong. 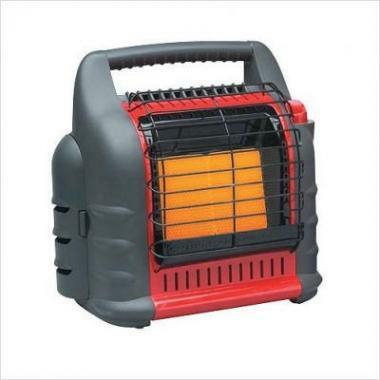 Overall, this is a great heater that is going to give you a huge amount of warmth on those colder nights. Golden Flame have been able to make this great patio heater that is one of the most highly rated products on the market with a long list of great reviews, giving you confidence that you’re going to be getting a quality product. It has a BTU level of 46,000 which is up there with the most powerful heaters. It has a pilotless burner system with no standing flame and also an ignition system that is going to be able to give you an immediate start. The product can be weighted at the bottom to give it an extra level of stability but there are wheels to be able to transport it, even when it gets very heavy. This is one of the best products on the market and has everything you need for a great patio heater. Enerco have been able to produce one of the best outdoor space heaters but with a unique design that is going to be able to allow you to use this heater anywhere. It mounts on top of a 20-pound propane tank, making it highly convenient. If you love camping, then this could be an ideal product as you could have it on your patio at home and then take it with you wherever it is needed. I can give a heat level of up to 14,000 BTU’s which is a lot less than other options, but that is down to its portability. It also doesn’t have the same level of area coverage but is ideal for smaller gatherings. It is a very safe product and one that should last for 30 hours. If you’re looking for a portable patio heater, then this would be perfect. This propane deck heater is a lot smaller than other options that we have on this list as it is intended to be placed on a deck or a table, rather than be stood up from the ground. That makes it very portable and prevents any awkward heater placement around a table. It has a stainless steel finish and a good range of safety features that are going to be able to keep you protected. It is able to produce 11,000 BTU’s which is a lot less than other options but is still going to be able to take the chill out of the air. It runs off a one pound propane take but can be connected to a 20 pound tank via an adapter. There is a burner screen guard to keep everyone sage and this is a product that is going to be ideal for anyone looking for a heater to place on a table. If you’re looking for a product that is a little bit different with a large level of style then this could well be the ideal product for you. It is an aluminum tube fire pit that contains a stainless steel propane burner for great warmth. The fire pit gives a great visual as everyone will be able to crowd around it when the cold sets in. It has a hammered bronze finish which looks brilliant and gives it a very high level of style and it’s certainly a product that is going to impress. It is able to give you a heat level of 42,000 BTU’s, making it highly effective at keeping the whole area warm. It can run off propane or butane and overall this is a great product which is going to be ideal for those looking for something a little different. One of the most important aspects to consider with patio heaters is where they get their power from. This will generally be done via a couple of different methods and the best one for you depends on your needs and your situation. Most patio heaters will run off gas, mainly propane. This means that you will be able to put the patio heater anywhere that you wanted to without having to worry about and cable or outlets. A gas burning heater is also going to be able to give you a huge amount of heat. This does mean having to buy tanks in order to keep the burner fueled which will cost more money than you would do if you were using electric. With the number of times that you will be using the heater and the convenience of it, this is not a problem for most people. The other way that you are going to be able to heat your outdoor area is with an electric heater. If this is powered to a wall outlet then you’re not going to have to worry about the energy running out which is one of the biggest advantages of this type of heater. Its immobility is a huge downside though as you will only be able to take it as far as the lead will let you. This can make it inconvenient at times and difficult for you. It will generally be cheaper but is often not able to produce the same level of heat. The range of the patio heater is going to be important to your overall comfort. The range is how far the warmth from your patio heater is going to be reaching out and therefore how many people it is going to be able to keep comfortable. This is going to be affected by a few different factors including the heat output of the heater. This is logical as the more heat that you have pouring out of it, the warmer the surrounding area is going to be but this isn’t a definite answer. If you had a heater that was directing all of that heat straight up then you wouldn’t be able to get a good amount of range at all. One thing that most people know is that heat rises, which is obviously a problem then the top of the heater is going to be above most people’s heads. In order to counteract that two things are very important. These heaters are able to emit radiant heat that comes off in the form of waves and therefore it is able to be directed at a source and doesn’t rely on the heating of air molecules around it as a radiator does. That means it is much less prone to the air blowing the heat away but that warmth still needs to be pointed in the right direction and that is generally done by the cone on the top of the device. All these factors will equate to the overall range that your heater has. Even if they are perfectly designed in order to minimize any heat loss, if the product doesn’t have a high amount of heat output then it’s not going to be able to give you the warmth that you need on those colder nights, and you might have to settle for using a camping blanket to keep warm. In terms of the heat output, this is measured in British Thermal Units which is pretty much always shortened to BTU. This is a measure of heat based on the amount of energy required to heat one pound of water by one Fahrenheit. To put it into a very simple example, a match that burns all the way through is able to produce almost exactly one BTU. All this information is hard to link to a patio heater so now we’ll talk about the ideal levels for these products. With free-standing heaters, they are generally required to cover a greater area and you will be looking for them to have 40,000 BTU’s or more as this will be able to give you a great level of control over your heating even though you might not always need to use the heater at its full potential. For table-top models, they will generally have a level of BTU’s between 10-15,000. The reason for the lower rating is due to the fact that these models are generally not required to heat such a large area as they will be able to cover everyone who is sitting around the table. Even though this is of vital importance to the overall effectiveness of the product, it’s not something that you really have to worry about. All the products that we have listed here are going to be able to match the area they need to cover with their amount of BTU’s. With these types of devices, it’s always a good idea to be able to control the heat output that is coming off the product. At their highest level, they are able to produce and an incredible amount of heat and if it’s mild this can get uncomfortably hot. Having a good level of control is important. The size of the area that you are going to be trying to heat up is important not only for the amount of heat you are going to need but also the type of heater that is going to be the most ideal for your situation. If you have a large elongated space, for example, then you might need two heaters in order to reach the area that you are going to be in. It’s going to be wide if you are trying to heat a large area with one heater to get the most powerful one that you can. The type of area that you are going to heat is going to be important too. These heaters need to be placed on solid ground as not only are they quite heavy, but also placing them on softer ground is going to increase the chances of them falling over. If you do need to place it on grass or a dirt area, then you have to do so with a large amount of caution and ensure that the ground is firm and that the base is flush to the ground. If this is not possible, then creating a concrete bass would be the wise step. On the opposite side of that, if you are only going to have to heat a much smaller area then it is going to be a waste of money and gas to get a full-sized heater. Getting a table-top model is going to be a much better idea. If you have a freestanding heater, then it is going to be very large. A lot of these models are going to be over seven feet tall which is something that you need to take into account when you are looking to buy one. There are quite a few freestanding heaters that are a little smaller than that but most of them are going to be quite tall. The reason for that is due to the fact that the product is going to need to cover everyone who is both standing up and sitting down. Thankfully most of the larger models have wheels on the bottom of them that will means that they are quite easy to move from one place to another. They still weigh quite a lot though and therefore this should always be done with caution. If you are only ever going to be sitting around a table then getting a smaller one would be the wise choice as you wouldn’t need either the amount of area covered or the heat output of a larger model due to the lesser requirements. Before buying such a product, it’s important to know exactly what you will be needing for and you need to plan ahead and figure out exactly where needs heating and the size you need. Getting the wrong type could be a huge waste of money. 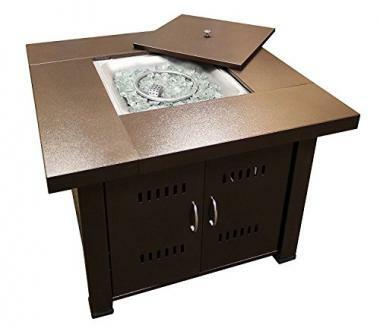 In terms of patio heaters, there are a few different options that you will be able to buy. This comes in the form of different types of heaters with various sizes and requirements but there are also different ways the heat can be provided too and here we will look at all of those options. As we have seen, freestanding patio heaters are possibly the most common type and these will be placed on the ground next to wherever it is needed. These are usually able to produce an extremely high level of heat output. That makes them ideal for large areas and also the types of parties where some people will be sitting and some will be standing. Not only do they give a great area of heat cover in terms of distance, but they also do so in terms on height too. These types of heater do take up a lot of gas which is a cost that you should bear in mind but this is going to vary in importance depending on how much you are going to be using it. 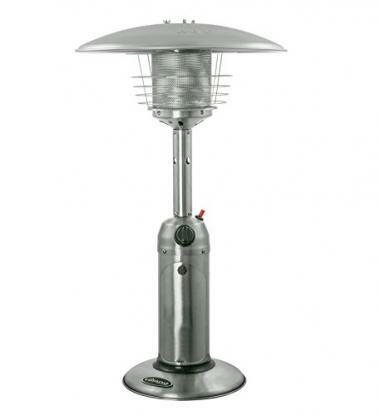 You can also get an electric patio heater but these are less common with freestanding models. Tabletop heaters can be a great option for those looking for something a little smaller and more compact. If the activity that you have in mind is a few friends huddling around a table then this is going to be ideal. It won’t have the same level of heat output as a free standing model but it will still be able to give you a great level of heat without taking up too much power. The models are also going to be a lot more portable but it’s important to ensure that you are placing them on a solid and level surface. There are also wall heaters too which you can affix to the side of a property and heat up whatever is next to it. These are good for more cramped spaces and can usually be used indoors too depending on the model you choose. Outside heat lamps aren’t going to have the same level of heat output as even a tabletop model but will still be able to give you a good level of heat. Whether the best infrared heater is perfect for you or not really does depend on the specific area that you intend to be heating. With patio heaters, you will also have the choice of heating with electric or gas. With the larger models, they will quite often use gas as this means they are able to burn with an intense amount of heat but it also means that they are highly portable. Using an infrared patio heater can still give you a good heat level but these devices are usually confined to smaller models. They will be cheaper to run on the whole but you have the added inconvenience of having to ensure that you have a wall outlet and the limitations that come with that. The dome on top of a patio heater plays a key role in how it is going to be able to give you the warmth that you need. As we mentioned earlier and as most people know, heat rises and therefore you don’t want to lose it to the atmosphere. The dome is there to be able to direct the heat waves that are coming off the heater and direct them down to the people below. This is an essential part of any heater as any product without one is going to be ineffective. On most products, they will have a single dome but on the more powerful models they can have a triple dome and that can give you a much higher range of heat coverage as the spate dome will be able to deflect the heat in different directions. A single dome can still be highly effective though and a well-designed one is going to be able to give you a perfect heat range and evenly distribute it on different levels. On tabletop and freestanding models, a dome is going to be essential. Q: How Does A Patio Heater Work? A: Patio heaters have to overcome the challenge of trying to heat an outside area. If you imagine a radiator outside in the cold, the only people who are going to be able to get heat from it are the ones who are directly next to it. That’s because radiators work via conduction which means that the heat the air molecules that are around the radiator and that goes from one molecule to the next to heat a whole room. The reason that this works is that the air in the room is still whereas when you are outdoors the radiator is trying to heat the whole of the earth. Patio heaters work via radiation, which is nothing to be fearful of. This is the way that the sun works as the heat will travel in waves rather than from one particle to the next. This means that the patio heater isn’t affected by the air as the heat is transferred directly to you. These waves will lose heat after a short distance which is why the area of a patio heater is limited but it is much more effective than other types of heating options and will allow you to have a comfortable time when you are outdoors. Q: Are Patio Heaters Expensive To Run? A: This depends on a few key factors but the bottom line is that using a gas heater is going to be more expensive than using an electric model, but even an electric heater is going to use an intense amount of energy. This has to be taken into perspective into how often and for how long you are going to be using it. If you are going to be using it for a couple of hours once a week, for example, then the extra costs that you are going to be paying are going to be fairly insignificant. If you are going to be using it every day then these are costs that are going to need to be taken into account. Constantly having to replace propane tanks can be expensive, but not extortionately so. 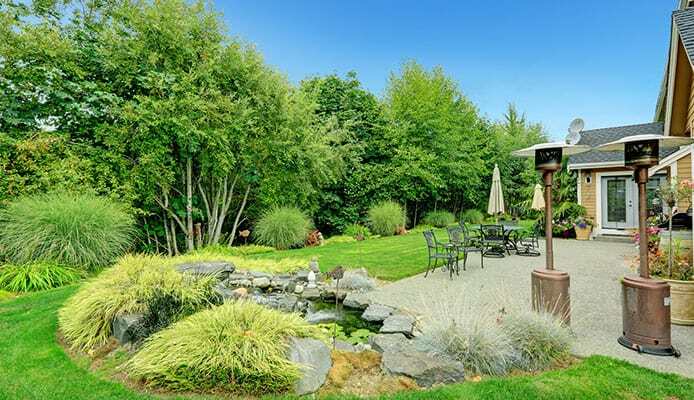 For many people, it’s a price worth paying for a warm outdoor area. Q: Can Patio Heaters Get Wet? A: Due to the dome that is on the top of most patio heaters, they are able to cope with a decent amount of rain as this is going to be deflected away from any of the key areas that you want to protect to give you a good level of protection. While it does have that initial protection, you don’t want it to be left out in the rain for too long, especially if it’s an electrical heater. They are not designed to withstand rain and therefore should be protected as much as possible. Due to this, it’s a good idea to put the heater away in a garage or other shelter when it is not in use to ensure that it stays dry. Another idea would be to cover it up to prevent rain from going on the burner but either way, you don’t want to leave it out in the rain. It’s a great idea to get the best patio umbrella for when the rains come. Q: Are Patio Heaters Safe On Decks? A: The bottom of patio heaters is never going to get too warm and therefore you don’t have to worry about what type of surface they are going to be on in terms of that, as it doesn’t matter if it’s a more flammable material like wood. What is important though is the level of the surface that you are going to be placing the patio heater on. You don’t want there to be any chance to the heater tipping over and therefore you always want to make sure that it is level with the ground. This means that placing it on soft or uneven ground would be a very bad thing to do and could lead to accidents from occurring. In respect of a deck then, it wouldn’t be a problem as long as that deck is able to give it a solid and even surface. Q: Are Patio Heaters Safe? A: Despite the patio heater high energy output, these are products that are going to be very safe as long as you are sensible about where they will be placed. Given they are an outdoor product, this naturally negates a lot of risks. One safety feature that can be brilliant for these devices is the ability to shut off once it tilts past a particular point. That means that if the patio heater ever got knocked over, the burner would be cut out before it even touched the ground. The products will also have a grid placed over them to ensure that you can’t directly touch the burner. Also, as these are tall products with a cool base, it doesn’t present much danger to any small children who wouldn’t otherwise know better. There is something enormously satisfying about sitting out there in the cool air while being warmed up by a nearby heater or by the best hot tub. It will along you to prolong parties, enjoy a sociable time or simply allow you to enjoy your outdoor area more than you could otherwise could have done. As we have seen here, before you choose the best patio heater for you there are plenty of things to consider. The main one is the size of heater that you will need and this will depend on a number of key factors in regards to the climate of where you live, the size of the area you need to heat and also how many people need to use it. This means that you have to choose the right patio heater in terms of the style but you also need to choose one in terms of how it is fueled too, whether that is by propane or electric. Electric is a cheaper option, but the power output and convenience of a gas heater makes it the more popular option when it comes to the larger heaters. Additional safety features and ensuring that it has an effective dome is also going to be important. As is making sure you’re protected when you are outside by getting an effective mosquito repellent to ensure that you avoid any bites. Once you have decided on the best type of heater for your situation, you will then be able to choose the perfect model for you to enjoy the warmth it will bring. 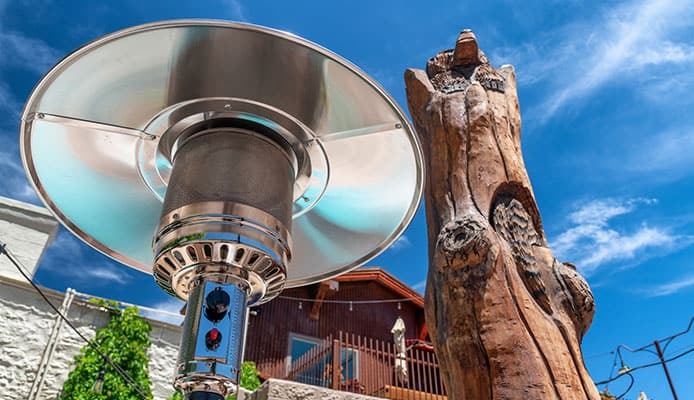 Hopefully this guide has given you all the information you need to be making you confident in choosing the best patio heater possible.